Visit Cameron Heights homes for sale for all property listings in this West end of Edmonton neighbourhood. The average selling price for a home in Cameron Heights in 2014 is sitting at $645,141. That is lower than the 2013 average sold price in Cameron of $677,727. These averages are based on single family detached houses sold in the neighbourhood, no condos or duplexes are included in the averages. The highest sold price for a home in Cameron this year has been $1,230,000, and that is lower than a 2013 sale that managed to sell for $1,425,000. It is taking 74 days to sell a home in Cameron Heights in 2014. That is slower than the Edmonton average days on market of 38 this year. Since 2005, Cameron Heights property values have risen by 67%. 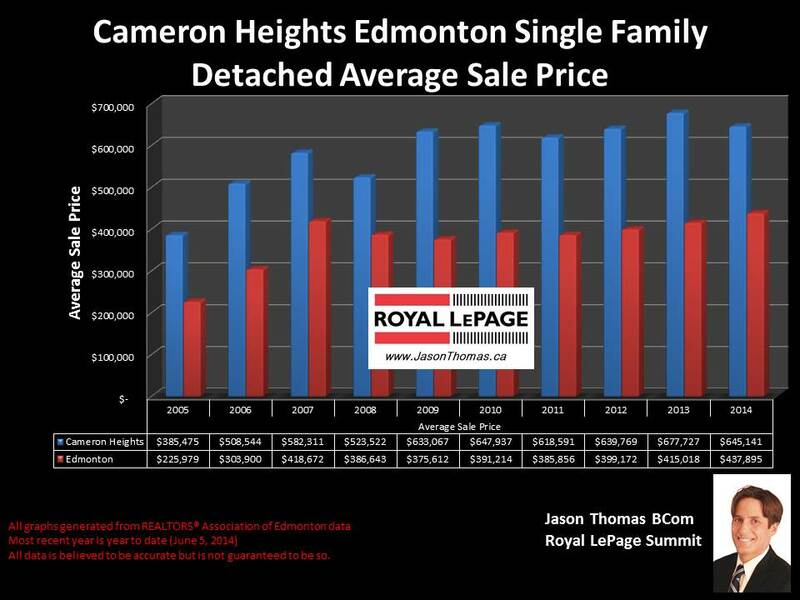 There have also been a couple lot sales in Cameron Heights in 2014. The average selling price for a lot in Cameron is currently at $313,750.